EVGA HYBRID kits are in stock as of this posting. The ones in stock are for those using the reference board. FTW3 versions are still out of stock. And the Ti version is gone. Regular 2080 version is still in stock. 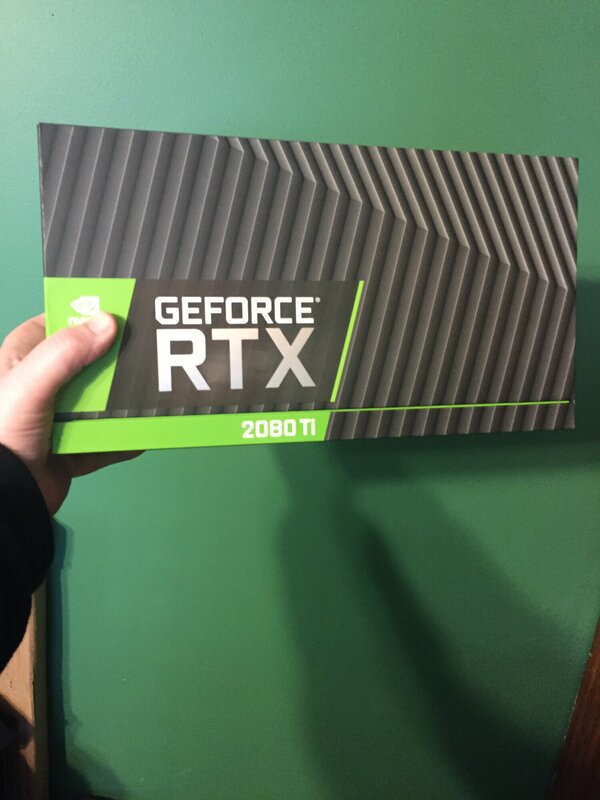 I just got the 2080 Ti version. Armenius and NestedRAID like this. Got my replacement 2080ti FE in today. So far so good. Armenius, NestedRAID and Supercharged_Z06 like this. If they had this earlier I probably would have got it instead of the two hydro copper water blocks but now I am fully committed to a custom liquid loop! Only have fans, fittings, and tubing left for the end of the month paycheck hype! While hybrids and AIO type products have their place/purpose, nothing is better than a good custom loop! I've found that once you put together and invest in a good setup, you'll be set for quite some time and will probably carry it forward as you upgrade CPU/GPU hardware. 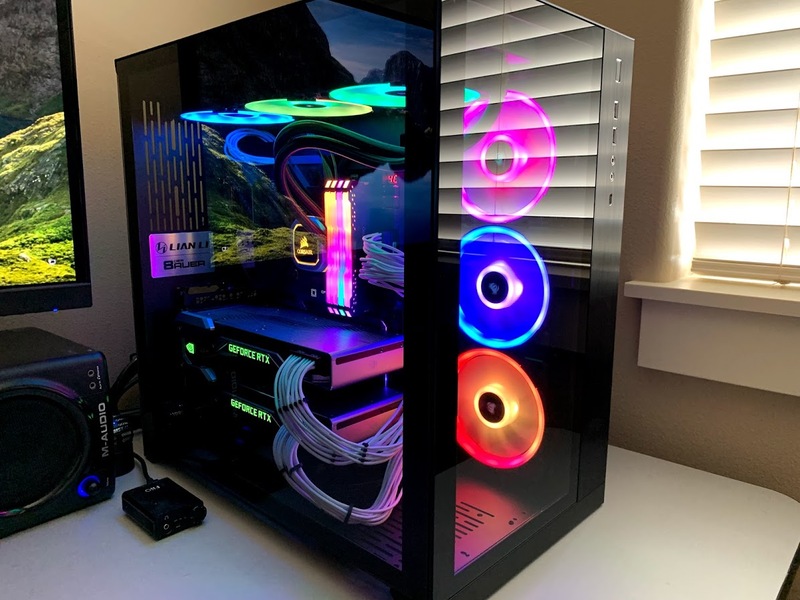 One thing for sure, you'll never have to sweat it as to running hot components - good cooling is like a "ticket to ride" when it comes to high performance overclocked hardware... without having to worry about heat issues / things getting cooked. Yea I'm really never going back to air after this. I can't wait until I get everything completed. 40-50C so much better than 80C. These two cards really pump out the heat. 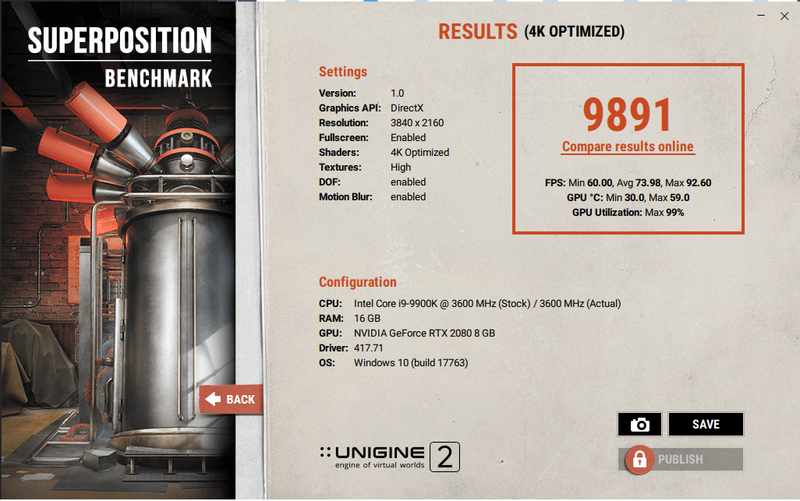 Hell the 8700K runs hot as hell too. Im barely getting this thing to 5.0 ghz w/o thermal throttling on air. DooKey, Armenius and Dayaks like this. Inno3d RTX2080 X2 Twin here. Stock cooler was complete garbage but the chip itself is magical. Armenius, Maddness and Dayaks like this. Kor FYI you shouldn't place hardware on the outside of anti-static bags. I am supersized that nzxt g12 with AIO is not more popular solution for GPU cooling.Counting the cheap price and temp improvements. Curious of the temperatures of the VRMs on the left side of the card. Are you using something to cool them? Or checking the temps? I don't have a measurement on them, there is a side intake pulling in air over that side of the card and small 40mm fan mounted at the rear at the level of the GPU to pull hot air away. Edit: Also the FE VRM is so ludicrously overbuilt that the total heat output of the VRM on that side under load is quite low (something like 15-16W under load with an OC with an assumed power draw of 300A). Not exactly screaming out for loads of cooling. 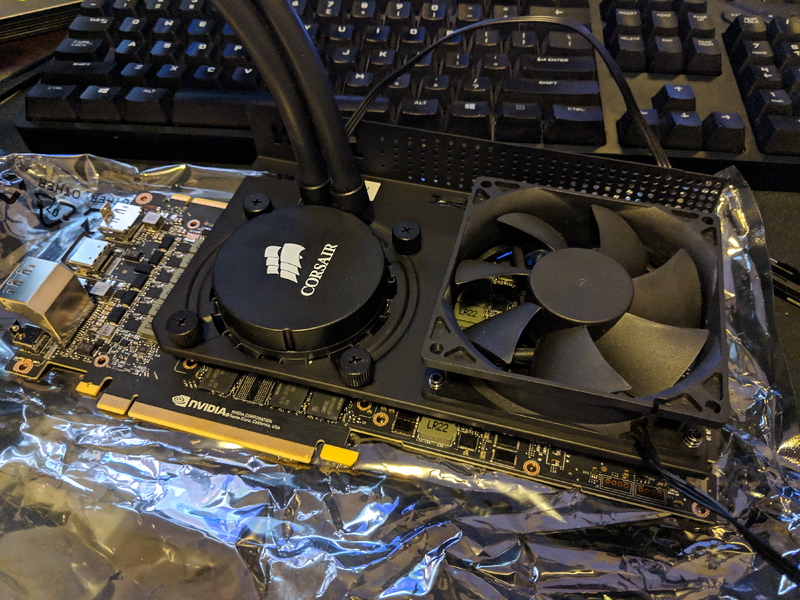 I don't have a measurement on them, there is a side intake pulling over that side of the card and small 40mm fan mounted at the rear at the level of the GPU to pull hot air away. Edit: Also the FE VRM is so ludicrously overbuilt that the total heat output of the VRM on that side under load is quite low (something like 15-16W under load with an OC with an assumed power draw of 300A). Not exactly screaming out loads of cooling. Yeah, I’d personally just put my finger on it. That’s low but the ICs are also tiny. Also sounds like you have airflow so that’s good. Yeah a small amount of air is all they reall need. Nvidia's braying about a full coverage vapor chamber is semi hog wash as none of the power delivery or memory components actually make direct contact. It's all transmitted through the based plate via 2 layers (both sides) of thermal putty and pads. 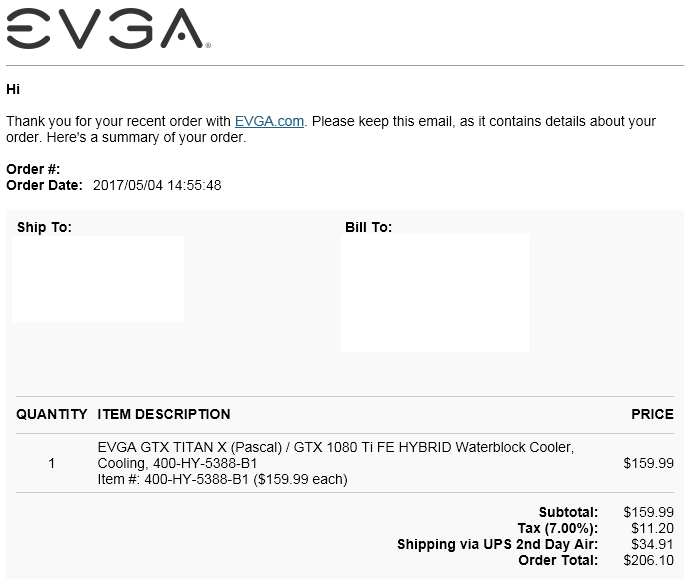 Got the shipping notification for the hybrid cooler. Should be here by Wednesday. Mine comes in Wednesday as well. Can't wait to install it. NestedRAID and Armenius like this. How's the hybrid working out for you? I'm curious what temps you're seeing under load. My guess is its comparable to most custom loops which means these things are a great bang for the buck. A little warmer than the Titan X with a 35-40C delta while gaming. Maddness and Solhokuten like this. What is the max temp you have seen? Have you had a chance to do any extended testing or gaming? Just wondering what the temps are when stabilized under max load. Max absolute temp observed was 69C in a 25C room when I was playing the Anthem demo. It's been running in the low 60s with Resident Evil 2 over the course of an hour or so. With just the power and temp limits at 123% and 88C respectively, the core settles to right around 1950 MHz while it would do 1860 with the air cooler at 80% fan speed and running at a temp of around 80C. Pretty decent temps. Not quite as good as I expected, but still pretty nice. They really need bigger than a 120mm rad on that thing. I get that they're going for universal compatibility but at least offer a 140/240/280 option. The pump does appear to be a standard Asetek design however the cold plate is custom. In theory you could tear down the AIO in that and transfer the cold plate to a larger unit. The hybrid for the Titan X was $160. Anyone looking for a bargain? For reference thats $2590.93. OCUK never fail to disappoint with their comical pricing. I got my 2080ti FTW3 Hybrid installed last night. Haven't had a chance to play with OCs or anything, but it seems to run about mid 50's C while gaming. There's a slight pump noise, but it's still quieter than a bunch of fans for sure. With a headset on, there's no way anyone would notice it. CoreStoffer, AthlonXP and Armenius like this. Well, it costs $1600 USD in the States. Add the average 8.5% sales tax and it's $1736. Subtract the 20% VAT and it's £1666.59, which is still $2144.10 USD as of today. Scan has it for £1439.99, which is inline with the pricing on this side of the pond. My only question: Is that real carbon fiber? If so, it just may be worth the price premium . I remember the GTX TITAN X using magnesium alloy in the shroud and it was so much lighter than the Titan X and its aluminum shroud when I changed it out. Does anyone get stuttering in BFV with your RTX 2080 Ti? RAutrey, xp3nd4bl3, Porter_ and 5 others like this. There is a Windows Defender exception I added for BFV that helped with the stuttering. I'll have to check which one it is after work because I can't remember off the top of my head. Even if you have Defender disabled you still need to add this exception since there are security settings that are active regardless of whether or not you use it. In App & browser control in Windows Security settings (I just type "Windows Security" after pressing the Windows key), scroll down to Exploit protection and click the Exploit protection settings link. From there, click on the Program Settings tab and add a program by directing to the file path. 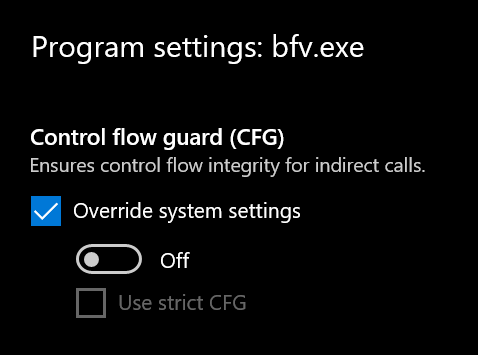 Add BFV.exe wherever you have it installed and scroll down to find Control flow guard (CFG). Check override and switch it off. You don't want to turn this off globally, so you can try this with your other games by adding an exception such as this. CoreStoffer and x3sphere like this. Awesome thanks This definitely helped, didn't have a single stutter in the last half hour I played! Well i needed a new GPU as my sons one bit the dust. I really wanted the new Vega card but after all the reviews i didn't really think it was the card for me. I haven't been on team green for a while. So i did the unthinkable. I grabed an EVGA RTX2080 Ti ftw3. And my very first game to try it out will be Metro Exodus. I'm currently updating Windows to 1809 to try out Ray Tracing and DLSS. Looking forward to it. nealx01 and x3sphere like this. Its an awesome card, my download is a little over halfway done for exodus also. Im really looking forward to trying it also. The FTW3 ultra is such a beast i went and got the hybrid cooler for it from evga and it never runs higher 55C. I am a bit bummed i got micron memory, and i havent been able to overclock it past +500 and +145 on the core. 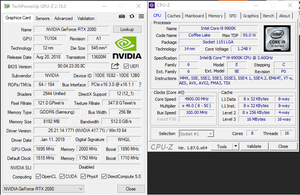 With the hybrid cooler my FTW3ultra runs at 2040 constantly with essentially no fluctuations. You're right there it is pretty awesome. I've never used the EVGA software before. On PX1 I just set the power limit to max and the card was boosting in Metro between 1950 and 2010 clock speed. The fans are quiet temps all over the card are very good. 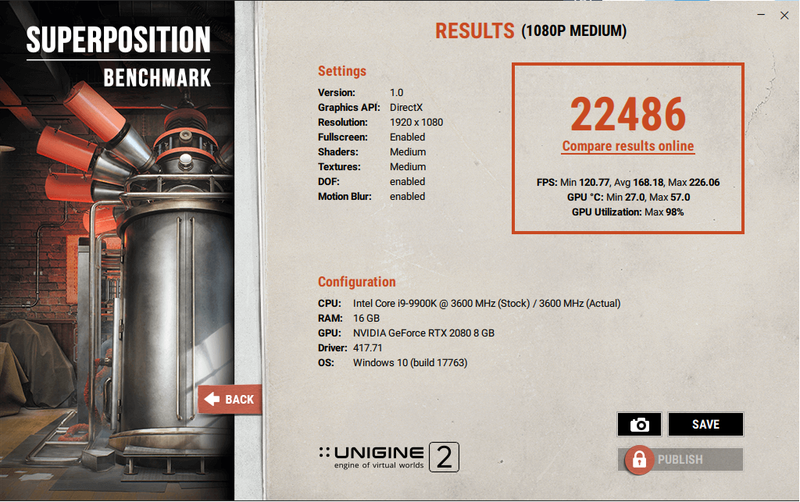 As I said, it's my first Nvidia card for quite some time and i'm impressed. 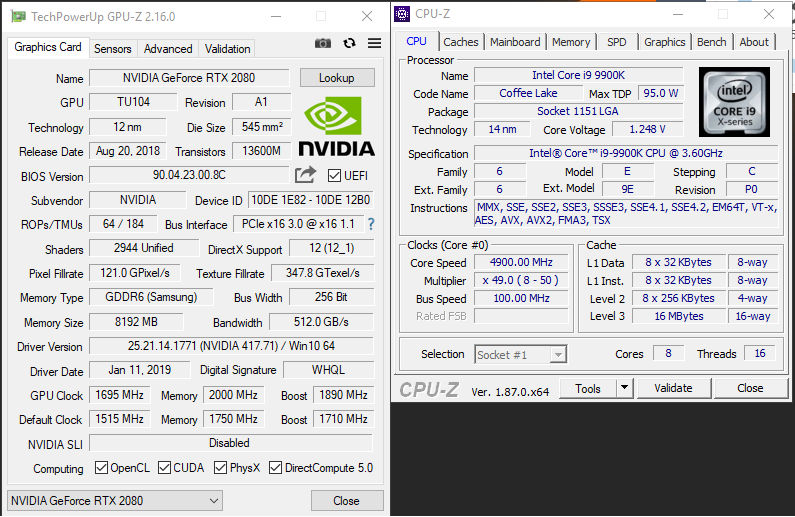 memory already runs fast on 2080 and 2080ti's, I don't recommend overclocking these new gddr6 modules until they further mature, not worth the extra 2-3fps. It's worth a little more than that, as they are just as bandwidth limited as the 980 Ti/GTX Titan X was. 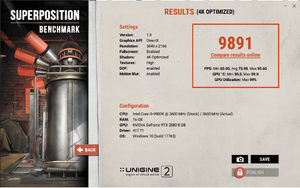 But I agree that it's too risky to overclock the memory at this point. 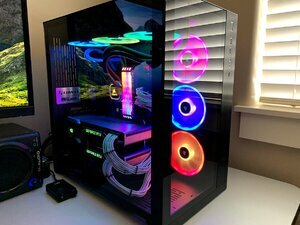 How does the this 2080 ti do under water in a custom loop? Do you know the power limit? These things can use around 400W if you let them. I run my card underwater and about 2060-2080 for 24/7 on the core and +700 on the memory. Could probably get a few extra Mhz if I really cared. So I guess the MSI makes the most sense since I can feed more power into it. Joining the club. 2 2080ti Founders Editions in my new build. revenant, Maddness and Armenius like this. May want to consider a new case if you're sticking with the stock coolers. They're no longer blowers, so all the hot air is being dumped into your case, and that case doesn't look like it has good airflow characteristics.